We hope Sully's Bulldogs have a little less bite than Richt's. Love you, Pat. There are some weeks when it’s not all that fun to be writing a weekly column on Auburn football. This is one of those weeks. We admit it—we were spoiled last season, in our inaugural campaign, as the Tigers won every game (and usually in some sort of spectacular, astounding fashion) and made this task into a joy and a pleasure. Four losses, none of them nail-biters. In two of the games, Auburn looked good for a while but then collapsed. In the other two, they never looked good at all. But onward we go, with only two games remaining before our bowl. And of course this week Auburn matches up against Stanford! Another top 15 team? We scheduled a PAC-12 powerhouse for Homecoming? 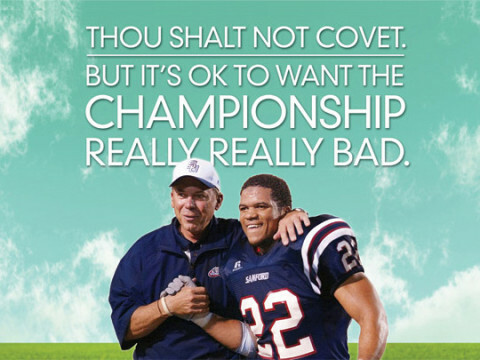 Ah well—we know Jacobs and Chizik know best. As in, Terry Bowden’s old school, not Chelsea Clinton’s and Condi Rice’s? Pat Sullivan coaching? No Andrew Luck? OK. The threat Level has gone down a little. Maybe we can get to seven wins after all. Last Saturday was a very, very long afternoon for Auburn fans. It was so long that some of us began to wax philosophical and wonder if that was the worst half of Auburn football we had ever seen. How did it compare to other terrible halves or complete games we had seen? For your reading (dis)pleasure, Van and John present: The Five Worst Road Games in Modern Auburn History. And we do this not to make the misery worse, but simply to remind ourselves that it’s not the end of the world and we have seen bad times before, and things always turn around and get better—usually much better—pretty quickly. What makes a football game truly bad? 2) Importance of the game. 5. Auburn – Syracuse 2001. The Tigers had waited fourteen years for a chance to exact some revenge on Syracuse for their boorish behavior after the 1987 Sugar Bowl. The game was played eleven days after 9-11 and the country was still traumatized. Auburn was undefeated, though the LSU game had been postponed till the end of the season. Freshman Jason Campbell looked good early and ran for a TD. Then Syracuse pulled away and won, 31-14. 4. Auburn – Arkansas 2001. (Or 1999, really.) Auburn had recovered from the Syracuse loss to reel off four big wins in a row, including a monumental triumph over Florida. Then the Tigers ventured into Reynolds-Razorback Stadium and the wheels came off. After suffering a 42-17 beat down, the Tigers would only win one more game the rest of the way, finishing 7-5 overall and 1-4 in their last five. 3. Auburn – LSU 2003. (Or 2009. Or 2011.) In all of these games, the Tigers ventured into Baton Rouge and were promptly thrashed. The 2003 game saw Auburn coming in with a five-game winning streak after a slow start, only to get crushed, 31-7, in a game that would be known as “Black Saturday.” The 2009 game saw Auburn score three more points than in 2003, but once again yield 31. This year’s team, of course, scored ten again but gave up 45 (!!). 2. Auburn – Alabama 2008. Auburn was not expected to win… but we had won SEVEN IN A ROW over the Tide… and we were blown out of the stadium, 36-0—our first-ever loss in Tuscaloosa in three centuries. Ugh. 1. Auburn – Florida 1990. The Tigers went to Gainesville at 6-0-1 and highly-ranked, their only blemish a last-minute draw with Tennessee earlier in the year. Steve Spurrier, in his first season with the Gators, taught Pat Dye a lesson in airing out the football; after an early, 7-7 tie, the Gators reeled off 41 unanswered points and sent Auburn limping home at the wrong end of a 48-7 mangling. This game marked the moment that the SEC’s dominant coach stopped being Pat Dye and started being Steve Spurrier. Now we may add to that illustrious roster of ineptitude the debacle known as Auburn – Georgia 2011. The first half of last Saturday’s game certainly merits consideration for this list. Pass coverage, pass defense, blocking, ball security—it all was a disaster in the first half. When Auburn could not take advantage of UGA’s weakness on special teams it was clear that things were not going to go well. 1. While the initial landslide of criticism has been aimed at the defense, we are going to start with the offense. It is clear that Auburn believes it can only move the ball and score points against good defenses if it tricks them. Gus Malzahn and the other Auburn coaches do not believe the Tigers can line up and run the ball against good defenses. Or use a mix of regular runs and play action. Against LSU and Georgia the play-calling (during the times when the games were in doubt) has been a constant stream of misdirection, trick plays and the like, designed to move the defense one way and then go the other. The 2010 Auburn offense pushed defenses out of the way and ran at them; the 2011 Auburn offense hopes to fool good defenses and then run into the empty area. This is clearly not a long-term winning solution. We have faith that Malzahn is doing what he thinks will work. That being said, Malzahn clearly believes that (for a variety of reasons) his offense cannot move the ball without the use of trickery in 2011. The hope has to be that the offensive linemen who are red-shirting this year can come in and help the line be more physical next year. And of course that Keihl Frazier will dramatically improve as a quarterback during the off-season. 2. On to the defense—and the complete dumpster fire on Saturday afternoon. Aaron Murray is the best quarterback in the SEC right now, but the Auburn secondary and lack of pass rush made him look like the best quarterback in SEC history. This game featured the single worst pass coverage we have seen at Auburn. The defensive ends, who seemed to be coming on a few weeks ago, were never near Murray (though at one point they were close enough to mail him a post card). The defensive line was manhandled in a similar fashion to our other 2011 games. Tackling in general was poor. Coaching changes? Rumors are swirling that Malzahn is a candidate for head coach of North Carolina. The five or six fans who hadn’t called for Ted Roof’s head previously were calling for it after Saturday. Auburn’s coaching staff has been very stable since Gene Chizik took over in 2009, losing only Tracy Rocker from that original group. Will things change this off-season? Has Gus been asked to slow down the offense to protect the defense? And does he want to go somewhere where no one can tell him that? How much responsibility for the failures on defense rests with Roof, how much on his assistants and how much on Chizik? Finally, one other important question: Just how good is this 2011 Auburn team? We started the year in full-bore panic mode, after the Utah State near-disaster. Then came a point a few weeks ago that we talked ourselves into thinking this might be a Top 20 team and the fourth best team in the SEC. No longer. In an effort to answer this question we went to “Football Outsiders” website and looked at their college football ranking metrics. These rankings use statistical formulas calculating how well teams do on each play or on each drive (both on offense and on defense). It takes out ‘garbage time’ yards and points. What we found was sobering. These numbers reinforce what our eyes tell us about this team: Auburn is a decent team and has played well in some close games and will go to a bowl this year. But there is a big gap between Auburn’s performance and the performance of the top-tier SEC teams, and these coaches and players have a lot of work ahead to close that gap before next season. Auburn’s defense noticeably improved after the first three games. The season-wide statistics did not show it, but if you watched and looked at the statistics on a game-by-game basis you could see it. Last weekend that improvement disappeared and the defense took a big step backwards. And some of the problems that were exposed look to be problems that could dog this team for a couple of years or more. Not to end on a sour note, but those looking to experience a revelation in the team’s performance in 2012 might want to start tempering their expectations a little bit. We give you the 2011 SEC, Ladies and Gentlemen: Two elite teams, one very good team, one good team, five mediocre teams and two awful teams. LSU. Bye week (otherwise known as Ole Miss) this week. Honestly, George McGovern had a better shot against the Electoral College than Ole Miss has against LSU. Alabama. Survived the post-LSU trap last week; fiddled around for a while and then put the hammer down. Arkansas. Still alive in the periphery of the National Championship conversation. But don’t look ahead to LSU! Georgia. Auburn has lost five of the last six games against the Dawgs. This is getting very, very ugly. Something must be done, and soon. South Carolina. Hey, everyone knew a team from South Carolina would have a great season in 2011… oops. Vanderbilt. Yes, Vandy is first among equals in the mediocre group. Auburn. Glad we don’t have to face mighty Vandy this year. We don’t want to contemplate the horror of a multi-game losing streak to the Dores. Florida. Dreaming of the 1990s. Tennessee. Also dreaming of the 1990s. Mississippi State. Dreaming of last year. Ole Miss. Houston Nutt says “Oh, UK thinks they are worse than us? What if I suspended our starting quarterback and running back? What then?” Not a man to take a challenge lightly, is Houston Nutt. IT’S PAT SULLIVAN HEISMAN 40TH ANNIVERSARY COMING BACK TO JORDAN-HARE WEEK HERE AT TWER: Read Kenny Smith’s sit-down interview with Super Sully, listen to “The Sullivan to Beasley Express” and “The Legend of Pat Sullivan,” and look at what Auburn students gave ol’ Ed Marinaro, that year’s Heisman runner-up. More Sully: His Heisman promotional brochure / Rare candids from his Heisman banquet / Pat Sullivan billboards going up in Birmingham. Of course it may not be modern to you folks. We beat South Carolina when they still had Lattimore, no small feat. For that we should be rated above S Car. I cannot believe you are forgetting one of the most painful road drubbings in modern Auburn football history in 1996 when a 5-1 (The one loss was the 19-15 lost to LSU in the Barn burning game) went to the Swamp to play a #1 ranked Florida team. The previous trip to Gainesville, Terry Bowden had taken a 17-point underdog to 36-33 upset. The Tigers were confident again. When Spurrier finished dismantling the Tigers the scoreboard read 51-10, Gators. Perhaps you are mentally blocking this horrific road trip. Note: Auburn was 5-2 against these same teams in the seasons following the road blowouts.